Heat oven to 375°F. Unroll dough; separate into 12 breadsticks. Cut each in half lengthwise. Roll each breadstick lightly to form 10-inch-long rope. 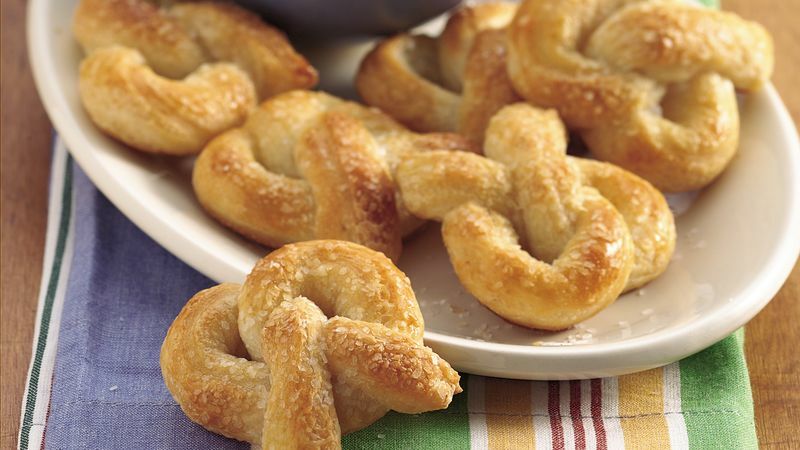 To shape each pretzel, shape rope into a circle, overlapping dough about 2 inches from each end, leaving ends free. Take 1 end in each hand; twist once at point where dough overlaps. Lift ends over opposite side of circle. Place 1 inch apart on ungreased cookie sheet. Brush each with beaten egg; sprinkle with salt. Bake 13 to 15 minutes or until golden brown. Meanwhile, in small microwavable bowl, mix cheese spread and milk. Microwave on High 1 minute, stirring once halfway through cooking, until melted and hot. Remove pretzels from cookie sheet. Serve warm pretzels with warm cheese dip.